So let's get some information. A lot of these articles have slightly different information from others so take some of the numbers with a grain of salt. This article: the attacks happened at 2:34 pm and involved tens of rounds of artillery. Some of them hit the island Yeonpyeong-do and one soldier died, 10 were lightly wounded, and 3 heavily wounded. The south fired back in response to this. There have been intermittent events across the DMZ since the 1960s, but this is the first time a bombardment/shelling has taken place since the 1970s. Civilian casualties on Yeonpyeong-do are still unknown. A total of 932 families (1780) live on both islands according to numbers from last year. Today at 10 am the South Korean military was carrying out a military firing exercise in the area, around Yeonpyeong-do and Baengnyeong-do, and North Korea warned them by saying that they would not overlook firing in 'their territory'. 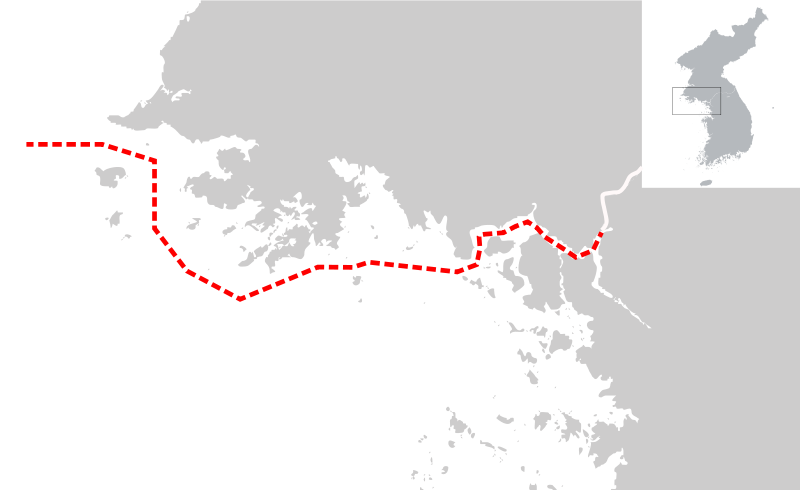 The South Korean military said that the training took place on the south side of Baengnyeong-do and the southwest side of Yeonpyeong-do, so the parts not facing the North, and said that the North fired on the west part of Baengnyeong-do and the south side of Yeonpyeong-do. 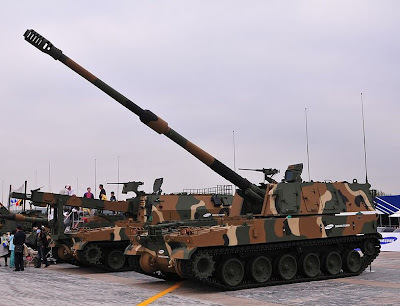 South Korea used K-9 self-propelled artillery to respond to this, firing some 80 shots in return. After South Korea fired back, the North stopped firing at 3:42 pm. The South scrambled F-15K jets from its base in Daegu (down in the southeast, next to the second largest city of Busan), and confirmation of the safety of South Koreans in the Kaesong Industrial Complex and Geumgangsan tourist resort is taking place, where 976 and 14 South Koreans work, respectively. Both of those are joint operations between the South and North but located in North Korea. From this article: North Korea fired a total of some 50 shells at Yeonpyeong-do. It also says that the South fired 30 times in return but that article is an earlier one so we'll assume 80. From this article: South Korean president Lee Myung-bak is being cautious so far, telling everyone involved to double check everything in order to avoid escalation. He's at the moment in the Cheongwadae (the Blue House, like the Korean White House) underground bunker in the National Crisis Management Center talking with the General Staff. They are saying that the North has used the South Korean naval exercise as an excuse to launch the attack. Also, civilians on the island have all taken shelter. - There was no extra firing from the North after 3:41 pm, and no sounds of firing could be heard in the area after that time either. - Firing started at 2:34 pm, continued for 20 minutes stopping at 2:55, then started again at 3:10 pm and continued for 30 minutes. - North Korean forces came from the Gaemeori Base (개머리기지) in Kangryeong county. - Some shells fell in the ocean, others fell on the marine corps and civilian houses in Yeonpyeong-do. - The South scrambled F15-K and F-16 fighters, and they are continuing to patrol the area around the five islands. The military says they will respond strongly to any additional attacks. - Civilians were taken to shelters in 20 locations. - As above, the North sent a message in the morning saying they wouldn't let the South carry out a military exercise around the islands. The South responded by warning them against any provocation and said they would continue the exercises. After that there was no response from the North. - The military is now on Jindogae-1 alert (Jindogae is a type of Korean dog, but here it's a code for military readiness similar to Defcon), which is the highest and involves putting all operational forces in a state of readiness. - The military is having another briefing right now (began at 6:30 pm, right now it's 6:50 pm). Twitter has been popular in Korea since around the summer, and this link shows current Twitter traffic containing the term North Korea (북한) as translated by Google if you want to see (though often badly translated) what is being said right now. The Korean internet is usually quite isolated from the rest of the internet due to just being really different (lots of reliance on ActiveX, and needing a Korean Resident Registration Number or 주민등록번호 just to register on most sites) so the recent increased popularity of Twitter is nice to have. Feel free to leave a comment below if you are curious about what a tweet actually means if the automated translation is wrong but has something that piques your interest. 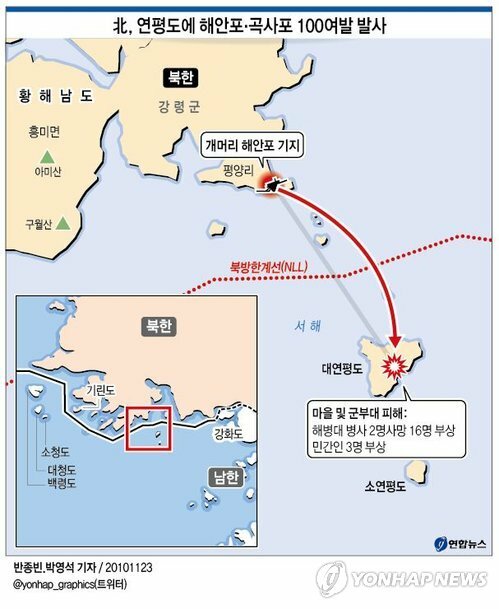 An article from a few minutes ago here has a statement from the North High Command that I think they just issued: it says that "if the south Chosun puppets encroach even 0.001 millimetres on our marine territory our revolutionary forces will continue to respond without mercy", so no backing down on the rhetorical side from them. An article here from 6:30 pm says the Unification Ministry here in the South has announced they will delay indefinitely a joint South-North Red Cross meeting that was planned for the 25th. The largest forum for expats in Korea has a thread here that started earlier this afternoon. Any event of this type always results in a thread of a few dozen pages there. 8:30 pm: someone just came to this page using the search term how far is Yeonpyeong from Daegu. The answer is 330 km. This map (in Korean) gives distances using the second button below the slider on the right that looks like a tiny ruler, so you can try it out for yourself if you want to know the distance between two points (the distance is given using km so you can read it). This article here from 7:30 has North Korea's statement on the news that the same lady always gives, where they said that the South fired first, saying: "In spite of our repeated warnings, the South Chosun puppets entered our marine territory at 1 pm today, and carried out a military provocation" and "our revolutionary forces responded immediately to the military provocation by the puppets with a strong physical response". You can also see an infographic here, which is pretty self-explanatory. The NLL is in red, the location of the NK base is where the artillery is shown coming from. It says that some 100 rounds were fired, composed of coast batteries and high-angle (howitzer) shells. - the Ministry of Defence says the response from the South was concentrated on the area where the attack came from, so they assume that a great deal of damage was done to the North side as well. From the news on tv now (9:00 pm): people from all five islands are going to evacuate, and extra ships are being sent right now to Yeonpyeong-do to evacuate them and are also bringing food (lots of ramyeon/ramen). Baengnyeong-do in the west has about 6000 people and a military base in the west that you can visit (not now though, of course). The reason why people visit there is because of the impressive cliffs in that place known as Dumujin, and you can see them here. About half of the families on that island have relatives in the North, since when Korea was a single country it was simply an island next to the province of Hwanghae-do, separated by just a few km of sea. You can see the northern side on a clear day from there. We have some video of the shells landing now. The building there is the myeon office (a myeon is an administrative district, kind of like a village). Here's another video with the myeon office plus a lot of smoke in the distance. Some more from TV news: one of the two soldiers that died was just days from finishing up his military service. He had written yesterday on his Cyworld page (kind of like Facebook in Korea) yesterday that he would be able to go home on the next ship.